Software piracy is the unauthorized downloading, copying, use, or distribution of software. Downloading and using software without paying for it is a common tactic of pirated software users. However, software piracy also includes distributing software on multiple machines when a license was only purchased for one, as well as copying software and redistributing it. 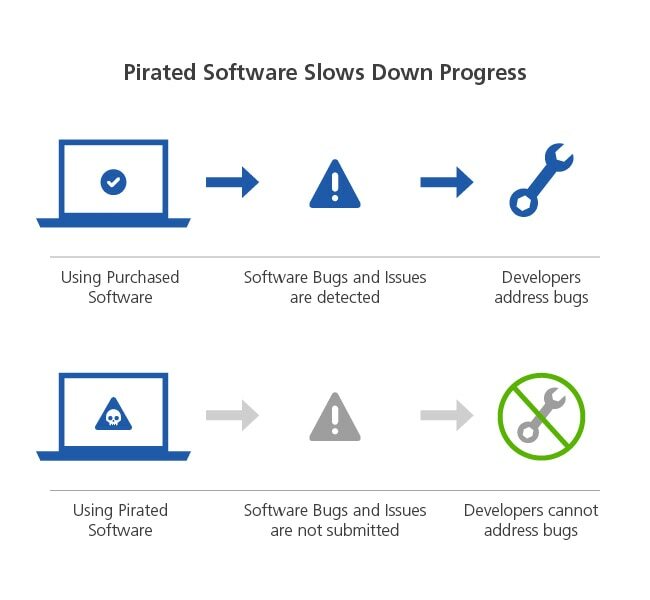 Take a moment to learn more about what software piracy is, the ramifications of pirated software use, as well as how to spot and ultimately avoid pirated software when it crosses your path. There are very few material goods of quality that most people would take for free. If a car were offered to you by a stranger with no warranty, vehicle history, or vehicle identification number, you’d likely turn around and walk away. Yet, many people don’t have that same reaction when it comes to illegitimate software downloads via torrent sites or unauthorized product keys found on the Internet. Despite the legal ramifications and malware risks being so high, nearly 43% of software worldwide is pirated according to a 2013 IDC study. What makes pirated software so risky? At the macro level, software piracy has widespread economic consequences. Global consulting firm Keystone Strategy measured the effects of piracy on companies in some of the fastest growing countries: Brazil, Russia, India and China. Their study found that enterprises legally downloading software face a competitive disadvantage of $1.6 billion. That figure jumps to a staggering $8.2 billion over a five-year software lifecycle. That translates to hundreds of thousands in wages and jobs lost as a direct result of piracy. Security issues attributed to malware attached to pirated software cost enterprises a projected $127 billion worldwide in 2014. Companies with pirated software found that nearly 20% came from software downloaded by employees on their work computer. Statistics are no rosier for consumers, who in 2014 spent an estimated $25 billion between labor and external costs of security issues created by malware from pirated software. What does software piracy mean for you and the economy? Security issues attributed to malware attached to pirated software cost enterprises a projected $127 billion worldwide in 2014. Companies with pirated software found that nearly 20% came from software downloaded by employees on their work computer. Statistics are no rosier for consumers, who in 2014 spent an estimated $25 billion between labor and external costs of security issues created by malware on pirated software. How can I protect and educate myself? Using previously registered software may be one of the simplest ways to fall victim to pirated software. The software was originally paid for, but this type of sharing could be in violation of restricted use software rules. Multi-license packs can also be tricky to deal with because they may have different legitimate product keys that should be used together, not purchased separately. Read end user license agreements carefully and confirm that the software can be shared on more than a few different computers if sharing is allowed at all. A few years ago, a software company made the news after settling a piracy case with a government organization for $50 million dollars because the company’s software was used on more servers than the organization had actually paid for. Another way pirated software is sometimes unwittingly acquired is by downloading it from unfamiliar platforms. According to Play-it-Safe, 30% of enterprise customers have bought software from suspect sources. Autodesk works with authorized resellers in multiple countries that ensure the product you purchased is officially licensed. Sticking with a list of trusted vendors can prevent you from potentially making a costly mistake. The use of unauthorized keygens is another method of intentionally obtaining pirated software. Keygens are programs created by software crackers that generate licensing information needed to activate a specific software. Cracked software users target downloads via offers like “autocad 2015 product key” and “autocad key gen.” The likelihood that using a keygen results in loading malware is very high. Not only can this make your computer vulnerable to viruses and malware that compromises personal information, the product key may not even work – and even if it does, it might be invalid, making it much easier to be flagged by authorities and putting unlicensed users at risk of fines and/or criminal and civil charges. If you download Autodesk software with good intentions only to find out it has been pirated, reach out to Autodesk and let us know. We’ll investigate further and hopefully prevent others from making the same mistake. Does Autodesk provide affordable options for software use? Learn more about what you get when you subscribe to Autodesk. Did you know NASA took the first zero-gravity 3D printer into space? Learn about 3D printing on Line//Shape//Space.